A tiny microbe has found its true home. The Tree of Life is a metaphor established by Charles Darwin to give some perspective to evolution. Every living organism on Earth has a home somewhere on the Tree, and by looking at it, we can see how species relate to one another. While we’ve known about a type of microbe called hemimastigotes since the 1800s, it turns out we were totally wrong about where they fit on the Tree of Life — because they didn’t fit on any of the existing branches. 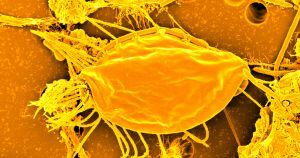 In a study published Wednesday in the journal Nature, researchers from Dalhousie University detail their discovery that hemimastigotes are so unlike anything else in the Tree of Life, they require the creation of a brand-new branch. “It was clear from our analyses that hemimastigotes didn’t belong to any known kingdom-level group, or even to a known ‘super-group’ of several kingdoms together, like the one that includes both animals and fungi,” researcher Alastair Simpson said in a news release. The Dalhousie team was only able to reach this conclusion thanks to an advanced genetic analysis technique that wasn’t available when scientists first discovered hemimastigotes. And as our technologies advance even further, there’s no telling what else we might discover — or how many other branches we might add to the Tree of Life.